The grandfather of roleplaying games introduced the concepts of classes to tightly characterize the personas you could play (e.g. fighters, wizards and priests – in the days yore called by different names). More recent designs scoffed at the restrictions classes impose and went with far more freeform approaches, e.g. fully skill-based systems where only the skills of a character describe him/her more closely of even less loosely coupled systems where simple descriptors, freely choosable attributes or similar mechanisms serve to describe a character. Personally I really love (and thus greatly enjoy) class-based systems – as long as they are well-done. And by well-done I mean “interesting”. Why? 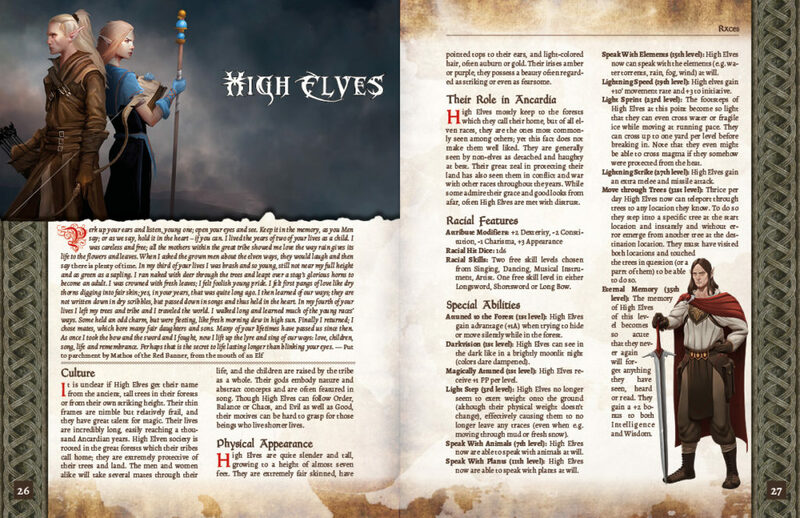 Because classes provide archetypes for a setting and help the players to quickly get into a certain mood. 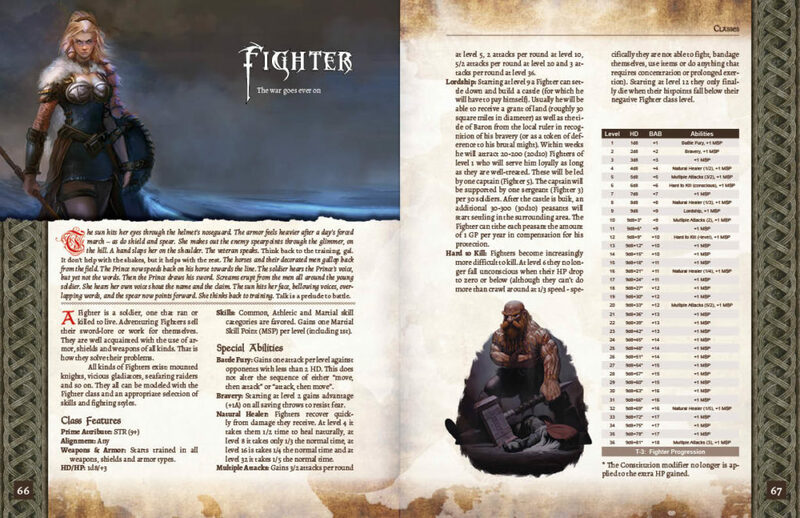 In the optimal case you just need to say a single word (“fighter”, “wizard”, “rogue”) and you already have an idea of where a character concept is going. Then more elaborate descriptions can follow. This also is very helpful when introducing newbie players to roleplaying. They quite often lack the experience to immediately build a cohesive concept for a character in more complex freeform systems (e.g. when having to choose from dozens of skills only without any further guidance). 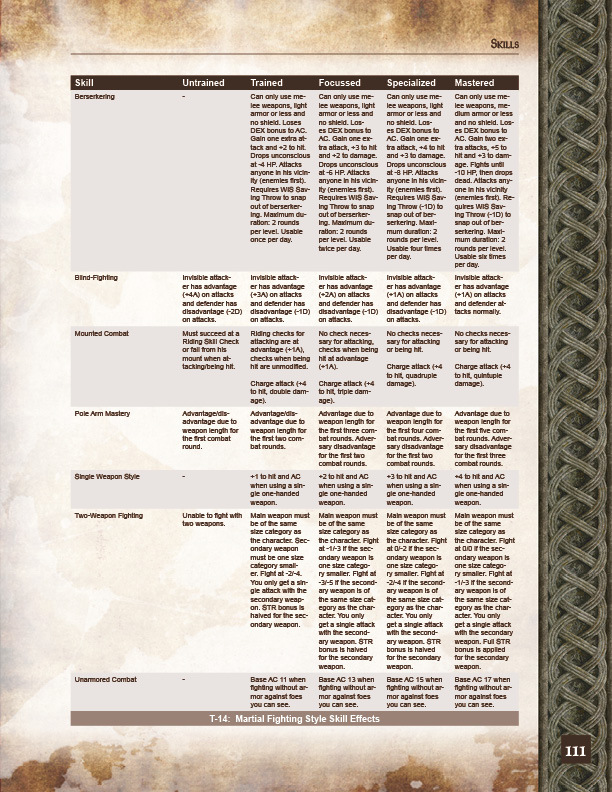 Additionally classes allow to model progress very nicely because it is rather easy for the rules to evolve classes along their archetype / theme. So in summary the rather old-school class-based approach to modeling characters for me always has been a success story. Consequently ADOM RPG also will use classes (and other mechanics) to actually help archetyping characters without (hopefully) restricting them too much. The race of a character provides its foundation. Races usually are very strong archetypes. If I say “Dwarf” you usually will immediately see a mental picture before you – a very different one than if I had said “Ratling”. As we explained recently races in ADOM RPG actually evolve their abilities with growing level – you become more and more of an archetype of your race. This actually is a very nice differentiator from most RPGs where race usually is a singular decision during character creation and then “it’s up to roleplaying” (which is good enough, but IMHO could be done better). Classes are a well-known mechanism, especially in fantasy settings. 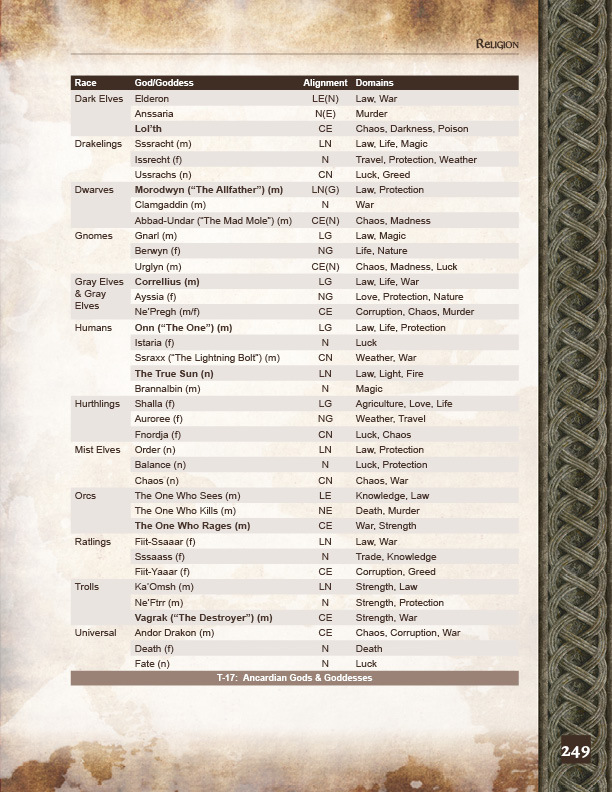 The popular tropes of Fighter, Wizard, Cleric, Thief, etc. easily help define a somewhat more specialized view of a character but still leave a lot of leeway. Is the Human Fighter a pirate, a hard-bitten mercenary from the western cities, a desert raider or a gladiator who survived the imperial arenas? Lots of room for characterization – sadly all too often with much mechanical game support in old school games. Now I know that for many people the very definition of “Old School Roleplaying” is “just wing it” but from my early RPG experiences in the 80s I vividly remember that we actually didn’t like that aspect too much. Quite to the contrary we where always searching for new rules extensions in magazines helping us to feel the less than fulfilling holes in the rules systems at our disposal. 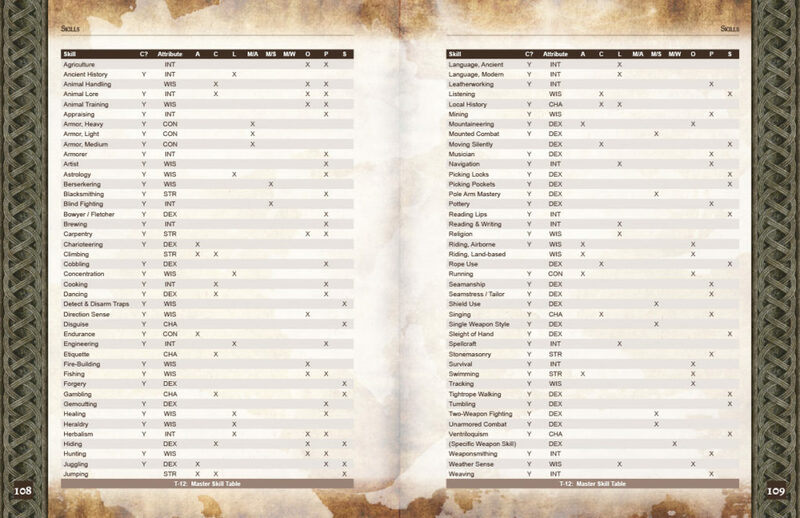 ADOM RPG this will allow you to specialize your class according to themes by providing some simple and common extension points. 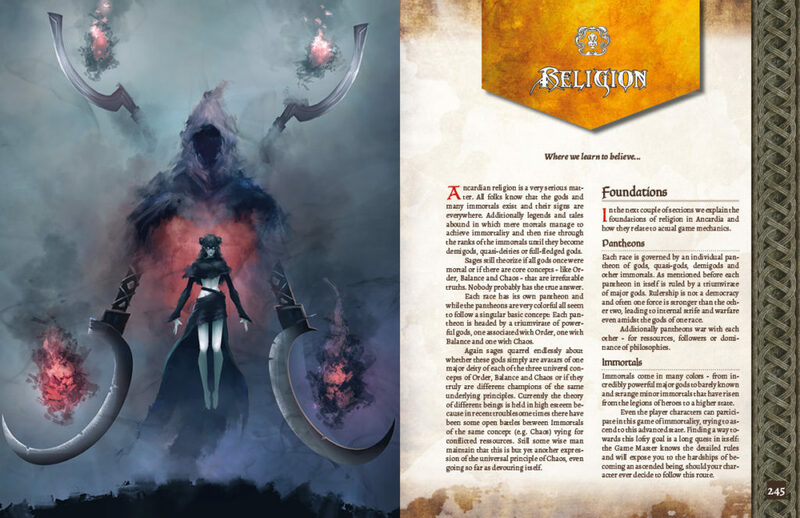 For most classes the skill system will be the core mechanic to use in order to bring variety to a character, for some classes like clerics it might be the deity you chose to worship (because said deity grants access to specialized domain powers which differentiate your priest from other priests). For fighters martial skills are the way to go. At each level a fighter gains a Martial Skill Point (MSP) he can use to advance some martial specialization. This pattern continues for other classes. 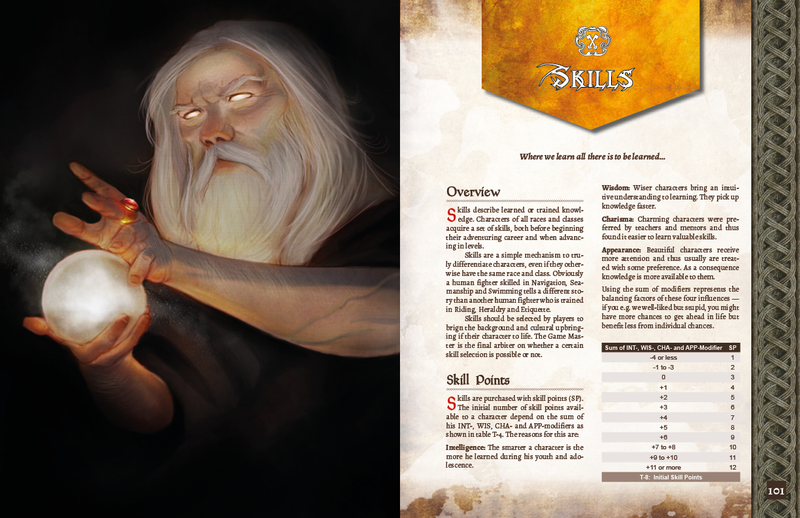 Wizards learn different spells (and have to focus as they can’t learn an unlimited number of spells per level), Archers focus on ranged martial skills, Thieves can select from many skills in the Subterfuge category in which they advance faster than anybody else, classes like paladins mix martial and divine spellcasting facets, and so on. So there is ample room to give personality to members of each class. Every character in ADOM RPG knows a couple of skills. Generally the skill system is more wide (less skills with broader application) than deep (highly specialized skills with hundreds of variations), again in order to be able to paint an archetypical view of a character. Imagine the Human Fighter mentioned a couple of paragraphs ago: If you know that he has learned the skills Navigation, Seamanship and Swimming you conjure up a very different image in your mind than if I told you that he has learned Riding, Etiquette and Heraldry. ADOM RPG uses the classical two alignment axis system of the first three advanced editions of the grandfather of all RPGs: Lawful (Order) – Neutral (Balance) – Chaotic (Chaos) and Good – Neutral (Balance) – Evil. Some people seem to find this constricting, my personal view is that it again is an extremely powerful mechanism to provide archetypes. A Laweful/Good ruler provides a very different idea than a Lawful/Evil one – once you understand the two dimensions. And these two words immediately help you to understand the general personality of a character. So a Chaotic/Evil Human Fighter trained in Navigation, Swimming and Seamanship makes a great (and nasty) pirate, a Lawful/Good Human Fighter focussed on Riding, Heraldry and Etiquette is a presentable Arthurian knight (or at least page 😉 ). Next Post: Kickstarter is coming!